Festivals and processions are a way of life in South America. Some festivities are based around variable religious dates, and in June 2019, it just so happens that some of most impressive events in La Paz, Bolivia, and Cusco, Peru, fall over a 10 day period. Our 14 night itinerary allows you to experience each of these festivals, as well as enjoy the stunning scenery of Peru & Bolivia, and world-famous places such as Machu Picchu and Lake Titicaca. In La Paz, the Fiesta del Gran Poder is a religious celebration devoted to Jesus Christ. The parade, which follows a 6 kilometre route through the main streets of the city, lasts for up to 12 hours and consists of over 30,000 dancers wearing extravagant and colourful costumes and masks. In Cusco, the feast of Corpus Christi sees statues of the Virgin and of Saints from Cusco’s churches paraded through the street to the impressive cathedral. The heart of the parade is the city’s Plaza das Armas, and the parade is followed by singing groups and marching bands. Taking place at the fortress of Sacsayhuaman, high above the city of Cusco is Inti Raymi, the Inca Festival of the Winter Solstice. Created by the Inca, Pachacutec, Inti Raymi was a tribute to the Sun God, Inti. On arrival into Lima, Peru, transfer to your hotel. Late evening flight to La Paz. On arrival, transfer to your hotel. 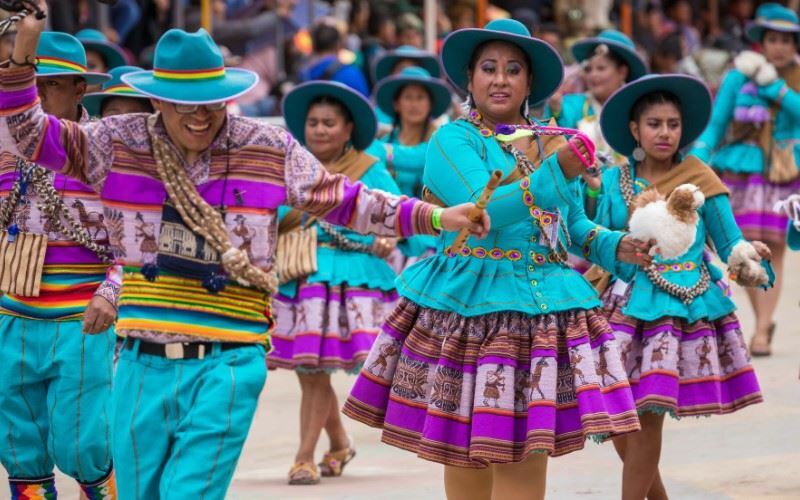 Enjoy watching this great parade and festivities in the streets of La Paz. See the highlights of La Paz and the Moon valley, and enjoy rides on the city’s fantastic cable car network. Take the tourist coach from Puno across the altiplano to Cusco, making several stops en route. This 5 star hotel is conveniently located in the upmarket Miraflores district. The facilities include the Sinfonia Restaurant offering an array of international and local dishes, the Opera Bar providing a good selection of cocktails, an indoor swimming pool and fitness centre. 96 air conditioned standard and superior rooms. Conveniently located a few minutes walk from the train station and the bus stop for Machu Picchu. Conveniently located a few minutes walk from the train station and the bus stop for Machu Picchu, El Mapi by Inkaterra provides modern contemporary accommodation right in the heart of Machu Picchu Pueblo (formerly Aguas Calientes). The accommodation consists of 130 smart but simply furnished rooms including superior rooms, superior deluxe rooms and suites. Amenities include La Cafeteria Restaurant which offers regional and international dishes using organic and local ingredients. There is also a bar/lounge. El MaPi is 3½ hours by train from Cusco, and 1½ hours from Ollantaytambo and provides a porter service from the station to the hotel.